This 80" Victorian contour bench is made with pre finished White Oak slats with a powder coated cast aluminum frame. 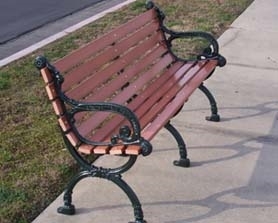 For extra strength the bench has a third leg in the center which has the arm rest removed. 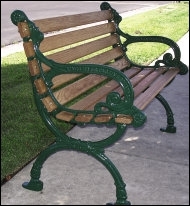 The ornate styling of these benches adds style to any commercial setting such as a park or garden. Park Tables offers a variety of outdoor site amenities made of wood such as trash cans, picnic tables, and benches made for commercial use.